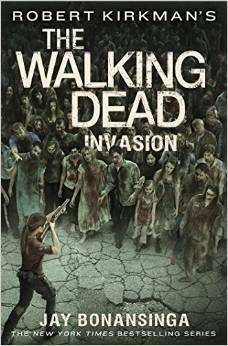 Invasion is 304 pages long and 100 of those pages could easily have been cut out. In fact, I think that had this been a novella instead of a book, it would have made for more exciting reading. From the very beginning it was clear that Jeremiah would return to Woodbury to cause havoc thus leading to a huge showdown with Lilly. Everything else in the middle was mindless filler and given its slow torturous pace, hard to read. I found that my eyes repeatedly drifted from the page and the call of Facebook to relieve my boredom almost impossible to ignore at times. The one thing this universe has never really done well is its inclusion of marginalised people. Naturally, Invasion follows along this path. First off, there are not GLBT characters which is probably a blessing given the writing. In this novel, we are introduced to two new characters of colour, Norma and Miles. Norma is described as a "portly African-American gal in a filthy gingham mourning dress, ancient tennis shoes, and a hairnet". We go on to learn that Norma was "born poor and fatherless in the Pleasant Hill area of South Macon, the youngest in a family of six kids, she quit school her sophomore year in order to support her family after her mama passed". Norma has no survival skills whatsoever; however, because she has been around so many bad men, she's quick to see the Reverend Jeremiah for what he is while others just follow along. Norma essentially is the racist Mammy stereotype writ large on the page. Miles isn't much better. Miles is a "twenty-three year old former meth-head from Atlanta- a convicted car thief who had gotten clean in rehab and gotten right with the Lord at Calvary Baptist." Miles catches on to the Reverend Jeremiah because being in and out of jail for petty crimes, "he knows a con man when he hears one." Lilly doesn't say much of anything to Miles throughout the book but when he drives with her in pursuit of the Reverend, how he hunches over the wheel while wearing a hoodie is enough for her to determine that his behaviour is a hold over from his criminal days. I suppose that Norma and Miles are a replacement for Bob (given how much this universe loves the T Dog train) but they're a poor replacement. Bob has been a character since the first novel in the series and though he's had his issues with alcohol, at least he's a well developed character. I was actually pretty sad to see Bob go, given that he's been consistently rationale in a way that Lilly just hasn't been. At this point, I'm only reading this series because we follow the comics, both television shows and have reviewed the games. If it were any other series, I would have DNF'd this book and not looked back. They are sucking this universe dry with these books. Invasion, in particular is too long and is outright boring. Not even the showdown between Lilly and the Reverend Jeremiah at the end held my interest. With Bob, the last interesting and nuanced character gone, there's even less reason to continue reading this. If you must read this book because you are following the series, do yourself a favor and borrow a copy from the library. You'll live in regret forever if you spend even five cents on this poorly written attempt to cash in on The Walking Dead fame. This series has gone long past the point of adding nuance and backstory and instead just drags along like a cockroach scrambling out of the rubble refusing to die.